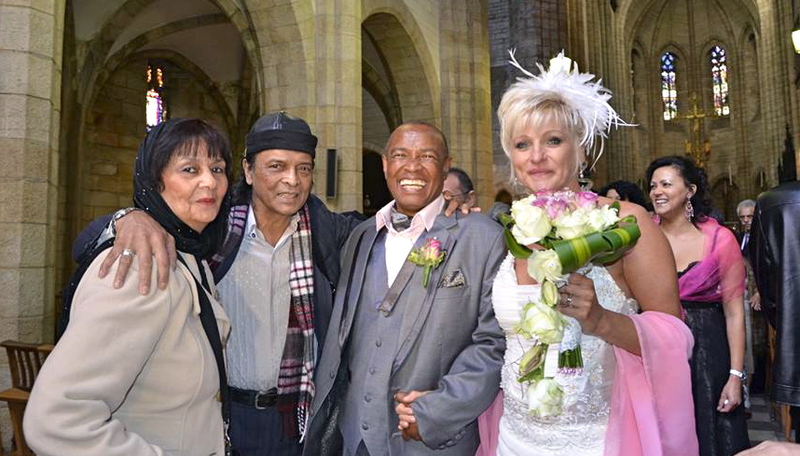 Les Kleinsmith with his brother Zayn and their wives Yadima and Isobel taken on Les and Isobel’s wedding day in Cape Town two years ago. I first saw Zayn perform at the Woodstock Town Hall in a show called The Golden City Dixies vs The African Follies. It was around 1964/65. And of course, I was blown away by this suave young man with the beautiful voice and polished stage presence. Since he was living in Walmer Estate and me in District Six at the time, I often saw him in the area in his spotless, shining, orange-coloured Ford-Anglia. I entered the showbiz scene around ’67. From time to time, our paths crossed on some of the variety shows. I guess, one could say, we clicked and through the years our friendship grew to a point where I was like one of the children in his mother’s house. I can safely say that I knew Zayn for the better part of 50 years. I worked with and shared many a stage with him. During those Sherwood Lounge days in the ’70s, Zayn was the one who talked me into doing cabaret as opposed to being the frontman for a band. Apart from the music, which was our most common connection, I have other very good memories of him that will live with me forever. To me, he was a friend, a brother, a mechanic, a carpenter and anything you expected from a true friend. I went to him with all my troubles — and I had many. He was a part of all my serious relationships. When they started and when they ended. Especially, when they ended !!! He was the shoulder I would cry on. He was my counsellor/therapist. Like his father, he was extremely helpful to everyone who crossed his path or knocked on his door . . . always full of advice. I have 50 years worth of memories of Zayn and more. “Zayn is my brother – My brother is Zayn”. With regard to his potential, no, I do not think that he achieved his full potential. Through the years, we all secretly dreamed of “making it overseas”. If anybody deserved it, it should have been Zayn. He had so much to offer and more. But, as you are well aware, growing up in South Africa during that period, we didn’t have much of a chance. And often, our personal circumstances didn’t allow for us to just up and go. Some of us are still fighting that battle today!!! It is safe to say that in South Africa, Zayn Adam is/was a musical institution. I love him. I will miss him dearly. My heart is in such pain. I feel like I have lost a limb. I can’t stop crying…………. I remember Zayn always outsinging taliep at the Star, so when we moved to Retreat it was a bonus knowing Zane Adams lives just around the corner.